After I made my first quiche the love for warm pies & tarts was unleashed. Especially since V as well as a neighbor couple who we are friends with loved the first attempt. I was egged [not encouraged ;)] on. My second attempt was this tart. Well let me tell you this recipe was born out of need to utilize the leftover pasta which was little and not enough to be enjoyed by 2 of us as a dish. So I decided to bake this as a tart. I tried working on things which had not gone well in my first quiche. One of them was getting the edges nice & curvy for my tart but as you can see I did a terrible job. :) I also decided to try a new dough recipe & found one at Joy of Baking. As always her recipes are bang on. The dough easily came together. I skipped salt as I used salted butter. I also halved the recipe to suit my pan size. 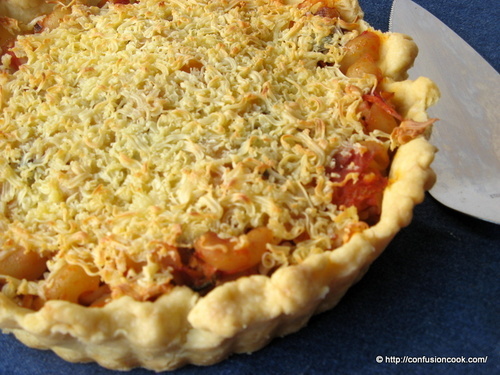 This time I blind-baked the pastry & made the pasta at night and quickly baked the tart for lunch. It was high butter to flour ratio so the crust was buttery, flaky & tasted absolute yum. The pasta was the best I’ve ever made. Younger V ate just the pasta as he is very fond of it. Older V ate more than half the tart all by himself. The neighbors drooled over the photos so much that I baked a pastry & gave them to make their own filling & enjoy the tart. 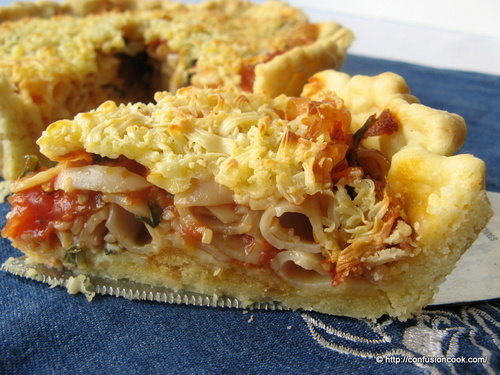 The pasta tart was a big big hit & I recommend everyone to make it once! Lightly grease the 6″ tart pan. Combine flour, sugar & butter & bring together using your fingertips till it roughly resembles bread crumbs. I used potato masher. You can use a food processor. Do not handle the mixture too much. Add about 2 Tbsps of water & bring together the mixture to form a dough. If necessary, add more water. Again do not handle the dough too much. On your work surface, make the dough into a ball. Flatten it a little to form a 5″ disc using your palm. Cover in cling film & refrigerate for 30-60 mins. Remove dough from refrigerator, lightly flour your work surface & rolling pin. Roll out a pastry about 3 ” bigger than your pan size. Keep rotating the pastry as you roll for evenness & to avoid sticking to the surface. Once the desired size is achieved, then gently roll the pastry onto your rolling pin & place it onto the pan with an overhang. Gently press the pastry in the pan. Do not stretch the pastry as it will shrink while baking. Flute the edges of the pastry. Chill the pastry covered in cling film and pre-heat the oven to 210 C.
Remove from refrigerator, use a fork & make some holes in the pastry to avoid ballooning of pastry. Now lightly grease one side of aluminum sheet & place the grease side down on the pastry. Fill the pan with rice or beans or pie-weights. Bake in pre-heated oven for 15 mins. Remove the pastry from oven, remove the aluminum foil & rice. Return it to the oven & bake at reduced temp. of 190 C for 10 mins. Allow it to cool. Heat oil in a heavy bottom pan. Add onions & fry them for a few minutes. Add tomatoes & spices. Allow the sauce to cook well for 10-15 minutes, till it breaks down. In the meantime, blanch spinach by passing through boiling salted water. Drain well. If it is still wet, use paper towel to absorb any extra moisture. Once the sauce is cooked, mix spinach & pasta. Adjust seasoning. 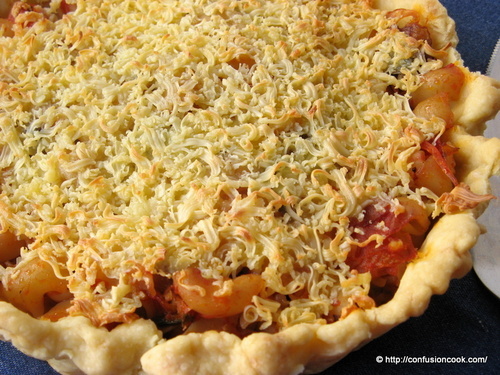 Spread half the cheese onto the base of the pastry. Pour the filling into the prepared shortcrust pastry. Lightly press it down & top it with remaining cheese. Bake for 40 minutes. Remove from oven & allow it to cool on a wire rack for 15-20 minutes.